Joel and I went out this morning bright and early. 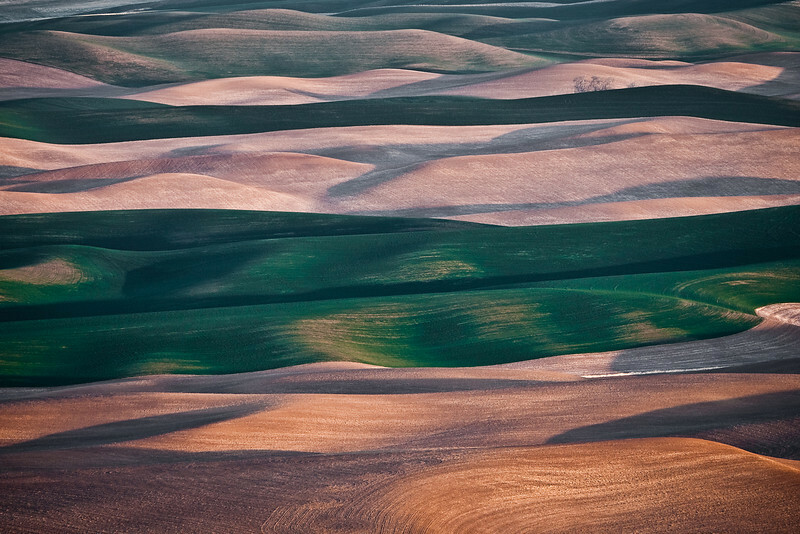 The alarm went off at 5:15 am and by 6 am we were on top of Steptoe Butte, ready for the corpuscular light. The fields are just beginning to turn green, and you can see a few lush areas in smal clusters. However, we are probably about 2 weeks or so from the peak of spring colors. The wind was howling, and we were freezing our you-know-what off! I had what I thought was a steady tripod, but I could still see tiny movements when composing my shots. I was forced to shoot between gusts and bump up the ISO to 400. If you are thinking of doing any kind of sunrise/sunset photography here, bundle up and carry a VERY steady tripod. I hope you enjoyed the shot above, my best from the morning. It was taken with the Panasonic GF-1 and 45-200mm (90-400mm equivalent) lens. After the low-angled light disappeared, we drove back to town and grabbed some breakfast. Then we drove to Pullman, WA and returned to Colfax via back roads, looking for interesting barns to revisit during better light. We didn’t find anything that really grabbed our attention. We’ll try again this afternoon after a little nap. Barns or no barns, we’re planning on going back to Steptoe Butte to shoot the sunset.